Recycled crafts are great fun to make and a good alternative to expensive decorations. Coffee cans are a popular container to reuse and recycle. 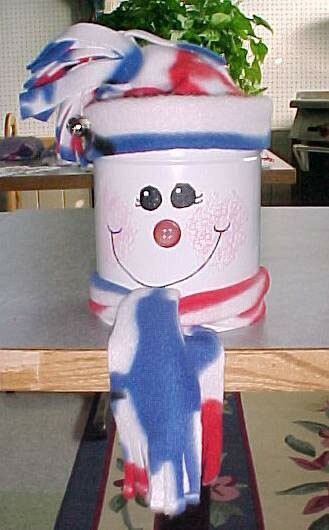 They can be a great creative starting point for making a cute Christmas snowman. 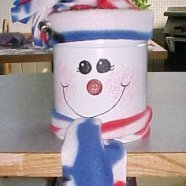 This is a guide about making a coffee can snowman. I spray painted an old coffee can with white spray paint then sponged white acrylic white paint for a textured look. I painted on black eyes, glued on a button nose and drew on a smile. Using a sponge, I dabbed on a touch of red paint for rosy cheeks. The hat and scarf were made from scrap fleece material. Sew or glue a seam on the hat and tie the top with a rubber band and cut in strips to the rubber band. If you want you can glue holly berries to the hat. I stuffed the inside with a present or cookies and gave as a gift. It can be used each year a decoration or passed on and refilled with whatever will fit. thank you so much for sharing this it is a great idea. I make cookies every year for family and put them in tins this year, my family will also get snowmen. I love snowmen and would have never thought to do this. Thanks for sharing. My son has 7 different teachers this year and this will be an ideal gift for them.